How to Draw and Paint Pastel: Horses & Ponies is an inspiring instruction book that shows you everything you need to know to create breathtakingly realistic equine artwork in pastel. In these pages, author and premier wildlife artist Lesley Harrison shows you how easy it can be to capture these beautiful creatures in a range of poses, while sharing a wealth of her own special techniques and artistic insights. 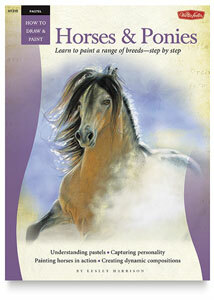 The book opens with essential information on tools, materials, color theory, and fundamental pastel techniques, giving beginners a good starting basis for more advanced practices. It then goes on to guide readers through eight easy-to-follow lessons, with plenty of helpful tips provided for each step along the way.